Prabhakar Patil, CEO of LG Chem Power Inc.
Korean battery maker LG Chem expects to grab 25 percent of global electric-vehicle battery sales by 2017 as battery prices fall and EV range rises. LG Chem appeared poised to dominate the U.S. EV battery market until Tesla Motors Inc. announced plans for its gigafactory in Nevada. No matter. 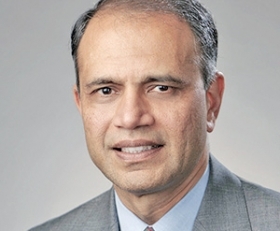 After years of disappointment, the EV market is ready to grow, predicts Prabhakar Patil, CEO of LG Chem Power Inc., the company's North American arm. Patil, 64, offered a glimpse of the EV's future during a Sept. 23 interview with Staff Correspondent David Sedgwick. Q: Consultant IHS Automotive predicts global sales of EVs, plug-ins, hybrids and microhybrids will top 5 million vehicles in 2017. What will be LG Chem's market share? A: We expect to have a 25 percent share. We know that we will be producing batteries for several automakers that we're talking with. LG Chem's Holland, Mich., plant makes batteries for the Chevrolet Volt and Cadillac ELR. At what percent of capacity is the plant operating? It's at 25 to 30 percent of capacity. What is the plant's break-even point? I can't tell you about our plant, so my answer has to be generic. Generally, plants have to operate at 80 percent of capacity. EV sales are slow in North America. Will Tesla and its partner, Panasonic Corp., cause a battery glut with the gigafactory in Nevada? I really wish them success. Tesla has shaken up the image of EVs and made it a product that people want to have. But their sales goal of 500,000 EVs -- that remains a question mark. Are Tesla and Panasonic overly optimistic? [Their sales goal] is a question mark. But I hope they are successful because it would benefit everybody. One thing Tesla has done very successfully is to change the image of the EV. Does the North American battery industry suffer from chronic overcapacity? Yes. Unfortunately, the hype about the growth of electric vehicles created unrealistic expectations, which make EVs look like a failure. But it's actually the other way around. Several U.S. battery makers went bankrupt in recent years. Can LG Chem be patient? That's what our strategy is. That's why this is not a business for companies that depend on government funds or venture capital. In both cases, you have to meet [production] milestones that you can't control. To maintain decent production rates, some plants make batteries for consumer electronics. Has LG Chem done that? We don't do that in Michigan because there is enough capacity to do it in Korea. [In the Korean plant], a lot of the production line stays the same regardless of the size of the battery cell. So LG Chem's Korean plant has the flexibility to make batteries for consumer electronics and EVs? How long will lithium ion remain the battery of choice? Is there any technology -- say, lithium air batteries -- that will replace it? We'll have lithium ion for at least the next 10 to 15 years. Before you put anything on the road, you need five years to validate your technology. So if you want to have a proven technology by 2020, you need to solve all issues in the lab by 2015. I don't see anything in anybody's closet that is ready for that.